If you look up the term water clock in a certain online dictionary (which will remain nameless, though you can find it easily enough), you will find that the definition, in its entirety, is “A clepsydra.” (And you thought lexicographers didn’t have a sense of humor.) I’d like to be at least slightly more helpful here by telling you a bit about one of the oldest devices for measuring time. Of course, units of measure like seconds, minutes, and hours are a mere arbitrary fiction. Days, years, seasons, and perhaps months (at least lunar months) correspond to easily observed natural phenomena, but any unit shorter than a day is a pure human invention. Had history unwound differently, a second might be shorter or longer than it is now, or we might have divided the day into, say, 537 bligrots. The specific choices our distant ancestors made are, in the grand scheme of things, not nearly as important as the mere fact that they figured out a way to quantify time, repeatably and fairly accurately. It is incalculably important that we be able to determine such things as how long a lawyer should be allowed to speak, whether the athlete who won the race today went faster than the athlete who won yesterday, or when lunch begins. The earliest clocks, which relied on the sun, proved problematic for a number of reasons—the sun was visible for a different amount of time from one day to the next; timekeeping could not take place indoors, at night, or when it was cloudy; and even with a sundial, it was quite difficult to determine the sun’s position accurately. The first attempts to keep time without the sun were water clocks—any of a large number of designs that have in common a dependence on the steady flow of water. 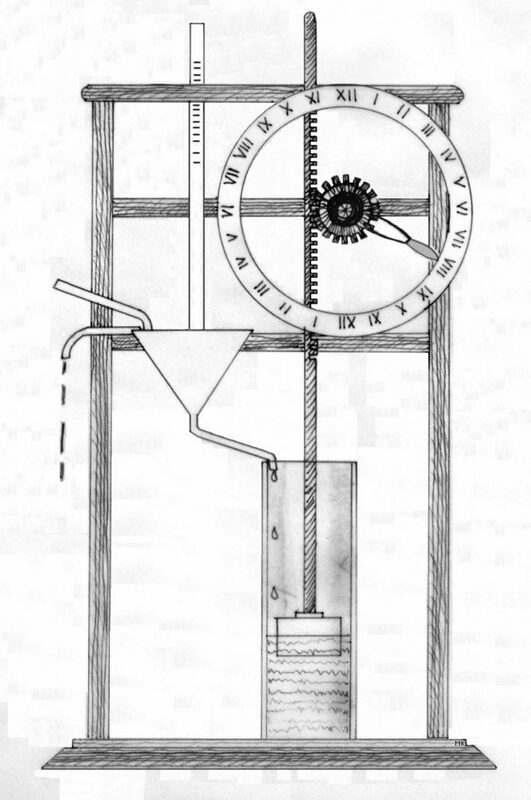 The simplest water clock design, known as an outflow water clock, was basically a stone or earthenware container with a small hole in the bottom and graduated markings on the inside. As water dripped out (at a more or less constant rate), the water level dropped, revealing successive hour markings. Inflow designs used two containers: one to dispense the water and another, into which the water dripped, to measure it (additively rather than subtractively). Some sources credit the Chinese for inventing water clocks as early as 3000 BCE; others say water clocks appeared much later in China and that it was the Egyptians, around 1500 BCE, who first came up with the idea. In any case, water clock designs certainly developed independently in more than one place. We do know that the Egyptian design had made its way to Greece by 325 BCE, where it was given the name clepsydra, which means “water thief” (the word kleptomaniac comes from the same root). Although even primitive clepsydras were sometimes more accurate than watching the sun, they were still notoriously irregular, because the water had the annoying tendency to drip out more slowly as its level sank. To compensate for this, some Egyptian designs tapered the container in toward the bottom. A further refinement added by the Greeks was a float regulator—a valve that let more water into the tank only when it sank below a predetermined level, thus maintaining a constant water pressure and keeping the rate of flow quite regular. (This makes the water clock the forerunner of the water closet, if you think about it.) Later modifications included a second float—this one in the receiving container—which was attached to a pointer; this made reading the time, especially from a distance, much easier. More elaborate still were designs that used floats to strike a bell or make some visual signal at given water levels. But even these designs pale in comparison to a clepsydra built in China by Su Sung in the early 11th century. Su Sung’s clock was over 30 feet (9m) high and used a primitive escapement mechanism, a bit like what would later appear in mechanical clocks and watches. But instead of being powered by a spring or weights, it was powered by water. This clock displayed not only the time but also the positions of the planets, and included a number of animated figures ringing bells at various times. No matter how many bells and whistles a water clock has, though, you still have a couple of problems. For one thing, the flow of water will never be truly precise over a long period of time. For another, you’re fighting evaporation. And the rate at which the clock runs can be influenced by temperature, humidity, barometric pressure, and many other variables. The best water clocks were accurate to within about 15 minutes per day—not too shabby for thousands of years ago, but a bit less than what we need today. Even so, the wonderful thing about a clepsydra is that even a child can make one out of scrap containers found in the recycling bin—it’s a refreshingly low-tech solution to one of humanity’s oldest problems. Note: This is an updated version of an article that originally appeared on Interesting Thing of the Day on April 26, 2005.